T-Racer munstycken 26433380 https://www.kaercher.com/se/tillbehoer/T-Racer-munstycken-26433380.html Högkvalitativa ersättningsmunstycken för alla T-Racer (ej T 350) i K2-K7 klassen, för hängrännerengörare PC 20 i K3-K7 klassen samt för chassirengörare i K2-K5 klassen. Högkvalitativa ersättningsmunstycken för alla T-Racer (ej T 350) i K2-K7 klassen, för hängrännerengörare PC 20 i K3-K7 klassen samt för chassirengörare i K2-K5 klassen. Hög kvalitet för en lång livslängd. Rengör och lossar hårt sittande smuts. T-Racer munstycken is rated 4.1 out of 5 by 7. Rated 5 out of 5 by clacker from Just what I needed They are ideal for now as with all the rain we have had my paths are ready for a clean and my old nozzles are worn out. Rated 4 out of 5 by Patio Man from Accessories Purchase I borrowed my friends Karcher K4 Premium Eco Logic Pressure Washer. It’s brilliant. May buy one. Decided to buy him some nozzles for the patio head cleaner to return it in good order. Was surprised that despite knowing he had the grey ones, I could only purchase all colours. Seems a waste & unnecessary ( good little earner ) Rang customer care. Helpful but bit long winded. Quicker to buy via website. Got next day though, so good service. Thanks. Rated 5 out of 5 by MikeD from Transformational After fitting the new nozzles, it performed as new, it was brilliant again. Rated 3 out of 5 by Cashie from The correct nozzles work perfectly but! When you've worked out which colour nozzles work with your machine they work great. The yellow nozzles worked with my old machine but but apparently I need grey ones for my new K4 Compact. Who knew? 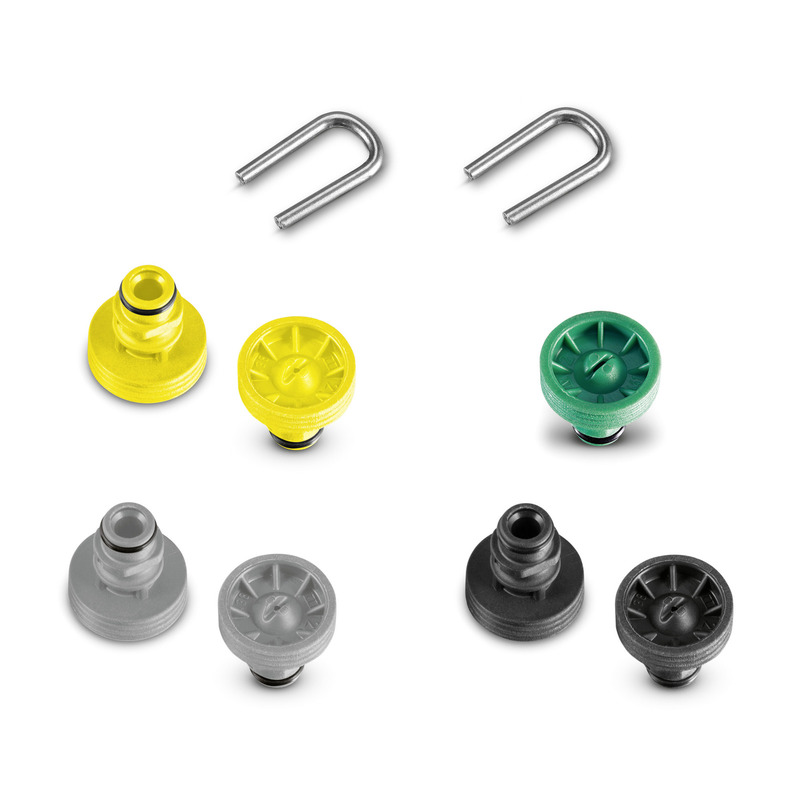 Why did I have to buy nozzles that I already had (the yellow ones) and the, useless to me, black ones as well as the new grey ones that I needed? The irony is that there must be be hundreds of customers out there who have the colour you need, surplus to requirement, if only you could contact them. Rated 3 out of 5 by Stewartmak from Great product shame about the waste Great product but do I have to buy other nozzles which are of no use to me? To cut down on waste, more of nozzle that has been ordered should be in the pack not nozzles for other models. Rated 4 out of 5 by john10 from a necessity I bought these some time ago but why did I have to purchase three types of nozzles when I only want one type!? Rated 5 out of 5 by jinxyjuja from Does exactly what it says Product was replacements we were after - does what it should !